I can’t believe it’s been a year already- but it’s birthday time again! This year, the little one requested Strawberry Shortcake. I liked her choice- Strawberry Shortcake allows for several different theme options. We could have done a simple sweet strawberry theme, an old school Strawberry Shortcake (or as she calls it, the ‘short-haired one’), or a modern Strawberry Shortcake (can you say Cherry Jam?). Having the girly girl that I do, she chose Modern Strawberry Shortcake. I’m excited to share the details of her party with you over the next few weeks, but first things first- the invitations! I’m pleased to have Printed Perfectly as one of my party vendors this year! My blogging buddy Kelly from Here Comes the Sun also has a super cute etsy shopped called Printed Perfectly. She designed these adorable invitations for me, sent them to me as a pdf file, and then I printed out as many as I needed. Kelly was easy to work with- I sent her the party information and a few details about the design that I wanted, and she had the invitation pdf in my email within a week. It doesn’t get much easier than that! Check out Printed Perfectly- she has several other too cute invitations in her shop, too! And it SO VERY STRAWBERRY! Oooh, those are super cute. I wish that I had known about them when my daughter was younger. 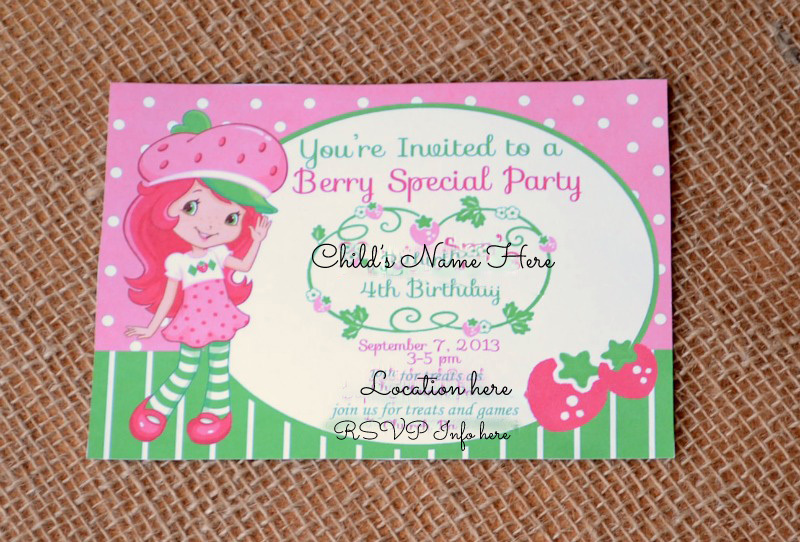 She would have loved Strawberry Shortcake invites! Thanks! I posted the invitations yesterday. Kelly from Here Comes the Sun did them for me! Really cute! You can find so many unexpected things on etsy. Thanks for sharing! I loved Strawberry Shortcake as a kid! SO cute!! Melanie these are precious! Thanks for sharing and introducing us to Kelly’s work…I just may have to use her in the future! I love, LOVE how these turned out!! Cute! Love Strawberry Shortcake! Flashbacks to my childhood! Cute! I loved making these for you! Thanks so much for the post!